The Delta Everly Bath Collections defined edges and elegant twist will add a distinct silhouette to grace your bath. The transitional design compliments a variety of bathroom styles from traditional to modern. Everly also features SpotShield Technology which means less water spots, less cleaning and antimicrobial protection of the finish. Delta's exclusive DIAMOND Seal Technology uses a valve with a tough diamond coating for a lifespan twice the industry average. Included InnoFlex PEX waterways keep water inside the faucet out of contact with potential metal contaminants. This powerful combination brings you a faucet built to last up to five million uses. This two-handle service sink faucet is tough and convenient, featuring solid brass construction, a rubber hose with a wall hook, loose-key stops in the shanks and a vacuum breaker. The lever handles on this model meet ADA requirements, adding to its commercial utility. This service sink is tough, durable, convenient, and intended for heavy use. Exposed pipes and industrial-chic finishes are just a few of the downtown loft-inspired design details that come to life in Arris faucets and accessories. Sharp angles and tubular lines dominate each piece in this modern collection. A matching suite of products is available to coordinate the look of your bath. 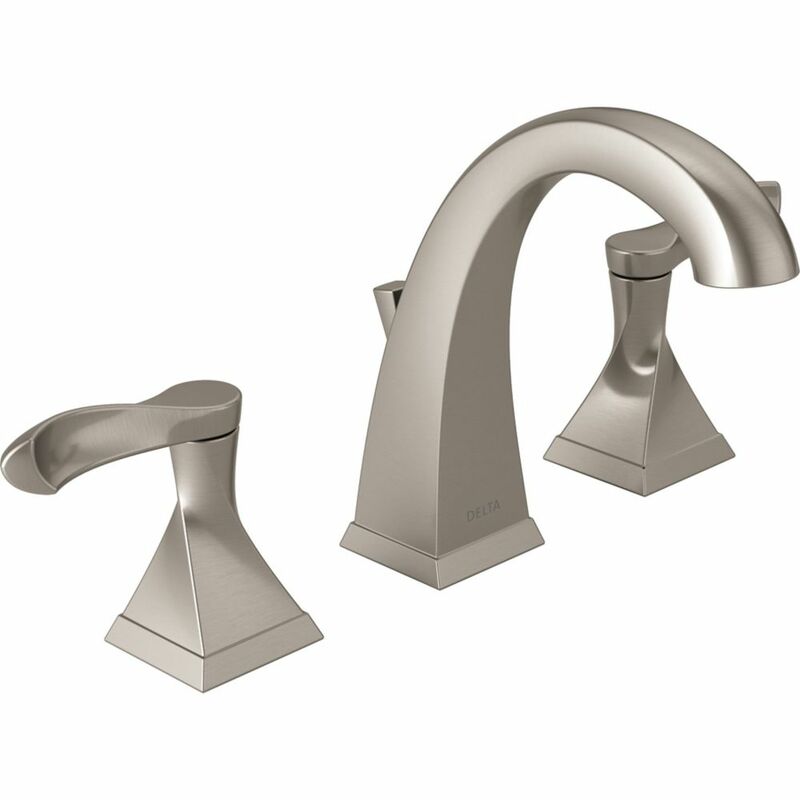 Everly Widespread (8-inch) 2-Handle High Arc Bathroom Faucet in Brushed Nickel with Lever Handles The Delta Everly Bath Collections defined edges and elegant twist will add a distinct silhouette to grace your bath. The transitional design compliments a variety of bathroom styles from traditional to modern. Everly also features SpotShield Technology which means less water spots, less cleaning and antimicrobial protection of the finish. Delta's exclusive DIAMOND Seal Technology uses a valve with a tough diamond coating for a lifespan twice the industry average. Included InnoFlex PEX waterways keep water inside the faucet out of contact with potential metal contaminants. This powerful combination brings you a faucet built to last up to five million uses. Everly Widespread (8-inch) 2-Handle High Arc Bathroom Faucet in Brushed Nickel with Lever Handles is rated 4.6 out of 5 by 161. Rated 5 out of 5 by BandMom from Such a hug upgrade from our very old acrylic handled,... Such a hug upgrade from our very old acrylic handled, low rise faucet. A joy to use daily. Sturdy, update style. Liked the look & feel of the indented handles for the thumbs... Buying the towel rack & cabinet handles to match - love!! Rated 5 out of 5 by Toady from Looks very nice and suits my purpose.... Looks very nice and suits my purpose. Rated 5 out of 5 by Roadrunner from Faucet has a nice, solid feel to it. Looks great too! I would recommend this faucet to others. I ... Faucet has a nice, solid feel to it. Looks great too! I would recommend this faucet to others. I love all of the matching products as well, like the towel holder, toilet paper holder and robe hook. Rated 4 out of 5 by Billy from Hard to give a review the faucet is not installed... Hard to give a review the faucet is not installed yet. It will be installed this Sat. and I will be glad to review after some use. The overall rating is for looks only .